What’s Happening Wednesday – Fourth of July Fun! 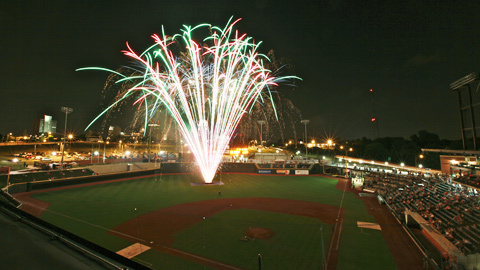 Winston-Salem Dash baseball game – Not only will you get to watch a baseball game but after the game there will an amazing firework show, set off right there on the baseball field. This game is Saturday and starts at 6:30 pm. Greensboro Grasshopper baseball game – The Stars and Stripes Spectacular will include a Hopper baseball game followed by a firework show. This game is Saturday at 7pm. Fun Fourth Festival – The festival will be held in historic downtown Greensboro on Saturday. This fun packed event includes a Freedom Run, a Kickoff Block Party, a Parade and Street Festival, as well as the Pops Concert and Fun Fourth Fireworks Finale. For more information about each aspect of this event, visit the Fun Fourth Festival website. Emerald Pointe Fireworks Show And Season Pass Appreciation – On Saturday the 4th, Emerald Pointe will host the award-winning Sky Scream Fireworks Show & Block Party. The party starts at 7:30pm and fireworks will start around 9:15pm. Visit the Emerald Pointe website for more information. Kernersville 4th of July Parade & Fireworks and Splash B4 the Blast – This fun-filled day starts at the pool and ends under a sky of fireworks! There will be Free hotdogs (while supplies last) at the pool. There will be live music, before the firework show, starting at 6:30pm. Fireworks will start around 9pm. For more information on locations of the events, visit the Town of Kernersville website. Independence Day at Old Salem – On Saturday, from 9:30am to 4:30pm, join Old Salem Museums and Gardens for an Independence Day celebration. Enjoy hands-on activities, demonstrations, music, games and more, including a moving naturalization ceremony at 10 a.m., throughout the historic district. The historic buildings will be decorated with flags that correspond with their era. For a list of all the activities and online ticket purchases, visit the Old Salem website. July 4th at the Children’s Museum (of Winston-Salem) – On Saturday, from 10am to noon, come make a firework craft and sound shaker. Then at noon join in a celebration of fun songs! Visit the Children’s Museum of Winston-Salem website for more information. 4th of July at Creekside Park – Starting at 4pm, Archdale will be hosting an event with carnival rides, food vendors, live music and a fireworks display. The event will be held at Creekside Park. For more information and directions, visit the City of Archdale’s website. Uncle Sam Jam – This High Point event will be located at Oak Hollow Lake and starts at 4:30pm (gates open then). There will be outdoor live music, food vendors, children’s crafts, entertainment and activities, and fireworks! Parking will be available in the park and surrounding lots. The cost is $10 per car. For more information and directions, check out the City of High Point website. Town of Lewisville Fourth of July Celebration – On Saturday, from 6pm to 11pm, the Town of Lewisville will host their annual July 4th celebration. This event will be located at Shallowford Square and include musical entertainment and fireworks at dark. This year’s band is Big Daddy Mojo. For directions and more information, visit the Town of Lewisville website. Fantastic Fourth of July Festival – This festival will be held at Finch Park in Lexington. Starting at 6pm, come join in a patriotic celebration honoring the nation’s Independence Day! This Free family event includes music, rides, inflatables and amusements for children and kids of all ages. Concessions are available. Fireworks will start between 9pm and 9:30pm! Shuttle service will be provided at the Rose’s Shopping Center. For more information call 336-248-3960 or visit the City of Lexington website. July 4th Pops Concert and Fireworks – On Saturday, from 7:30pm to 10pm, visit the White Oak Amphitheatre, in Greensboro, for a patriotic performance by the Greensboro Concert Band. It will be followed by a fun 4th fireworks display! This is a free event but donations are appreciated. Click here for more information.